RYOBI introduces the 18V ONE+ Cordless Brushless Jig Saw Kit. This jig saw combines precision and power without the cord. The brushless motor provides more runtime, faster cutting, more power, and longer motor life. When paired with LITHIUM+ HP batteries, you can get up to 3,350 strokes per minute on one battery charge. This Jig Saw has a cast aluminum no mar shoe for maximum durability, a sight-line blower that clears debris for accurate cutting, and an LED work light to increase visibility while cutting. It features a variable speed dial for slow starts to fast cutting, tool-free blade clamp for quick and easy blade changes, and a keyless bevel base that adjusts from 0° to 45° right or left for smooth and easy bevel changes. Backed by the RYOBI 3-Year Manufacturer's Warrant and includes (1) wood cutting blade, (1) 18V 3.0 Ah Battery, (1) 18V charger and an operator's manual. The Bosch JS120BN 12 V Max Barrel-Grip Jig Saw provides fast cutting and long runtime, making it ideal for cutting out unique shapes in multiple materials. An outstanding tool for finish carpenters, cabinet makers or kitchen installers, this compact jig saw has a compact size just 9.4-In. long and only 3.3 lbs. It provides a three-stage orbital action to match cutting execution with application, powering up to 2,800 strokes per minute, and it has a counterbalanced low-vibration plunge mechanism. It has a 45 bevel angle range. This light jig saw can cut through wood and aluminum; it delivers a 2-In. maximum capacity in wood. It has single-handed blade change with a tool-less T-Shank blade design. It also has an integrated LED light. The M18 FUEL SAWZALL Reciprocating Saw cuts faster than its corded counterparts and offers up to 2x more runtime and 5x longer tool life than competitive saws. Compatible with ONE-KEY, this is the industry's first Reciprocating Saw that wirelessly connects to a smart phone to Customize, Track and Manage a tool's performance and location. Unlimited Tool Customization allows you to connect to the tool and access predetermined set-ups for blades and materials or have complete control over output speed and power for the specific application at hand. Once the desired output performance is reached, the custom profile is then saved to the memory of the tool and the connection to the smart phone is no longer necessary. The app will track all ONE-KEY compatible devices within 100 ft. range of your phone. By building the functionality into the tool, not the battery, all devices are trackable even if the battery is not charged or on the tool. 18V ONE+ Brushless Jig Saw with 3.0 Ah Battery and Charger RYOBI introduces the 18V ONE+ Cordless Brushless Jig Saw Kit. This jig saw combines precision and power without the cord. The brushless motor provides more runtime, faster cutting, more power, and longer motor life. When paired with LITHIUM+ HP batteries, you can get up to 3,350 strokes per minute on one battery charge. This Jig Saw has a cast aluminum no mar shoe for maximum durability, a sight-line blower that clears debris for accurate cutting, and an LED work light to increase visibility while cutting. It features a variable speed dial for slow starts to fast cutting, tool-free blade clamp for quick and easy blade changes, and a keyless bevel base that adjusts from 0° to 45° right or left for smooth and easy bevel changes. 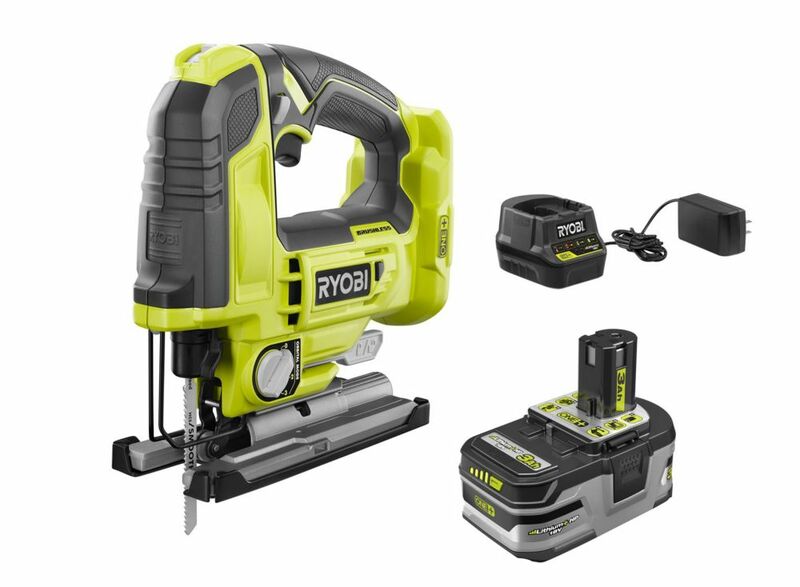 Backed by the RYOBI 3-Year Manufacturer's Warrant and includes (1) wood cutting blade, (1) 18V 3.0 Ah Battery, (1) 18V charger and an operator's manual.